Coyotes arrived in Florida more than 40 years ago as part of a natural migration to the eastern U.S. Today, coyotes can be found in all 67 Florida counties (and in every state but Hawaii). Coyotes are highly adaptable animals and have been spotted even in densely populated areas. It can be thrilling to see such an amazing wild animal, or to hear them at night. But there are many misconceptions about coyotes, and in recent years residents in cities across Florida have complained about a growing “coyote problem.” The most common complaint is about neighborhood cats disappearing. Small animals like rodents or rabbits make up the bulk of the coyote diet, although they will also eat bird eggs, fruit, pet food left outdoors, or scavenge in garbage cans. A hungry coyote will also target other small animals like cats. Experts advise treating coyotes as you would alligators: don’t feed them, and keep your small companion animals away from them. Don’t leave cats or other pets outdoors unattended. Being a responsible guardian and keeping cats inside will help them live longer, happier lives, and will allow coyotes and other wild animals to enjoy theirs. Don’t leave pet food outside. Covering your compost, keeping barbecue grills clean, and keeping trash in containers with tight-fitting lids are other ways to prevent attracting coyotes. Do not walk pets off a leash, and be more careful when walking small dogs at night (coyotes are most active at dawn and dusk). Coyotes in Florida have attacked small dogs on a leash. Experts suggest keeping small dogs on a short leash, and if confronted by a coyote, to pick up the dog. Making loud noises should be enough to frighten a coyote away. Coyotes usually try to avoid humans. It is rare for a coyote to bite a human. Coyotes are good for Florida, and they are here to stay! Coyotes play an important role in the ecosystem. For example, coyotes help to keep the rodent population in check. Sadly, several cities in Florida have hired private trappers in a misguided attempt to appease residents with exaggerated fears of coyotes. Trapping is a cruel, expensive and ineffective response to complaints. 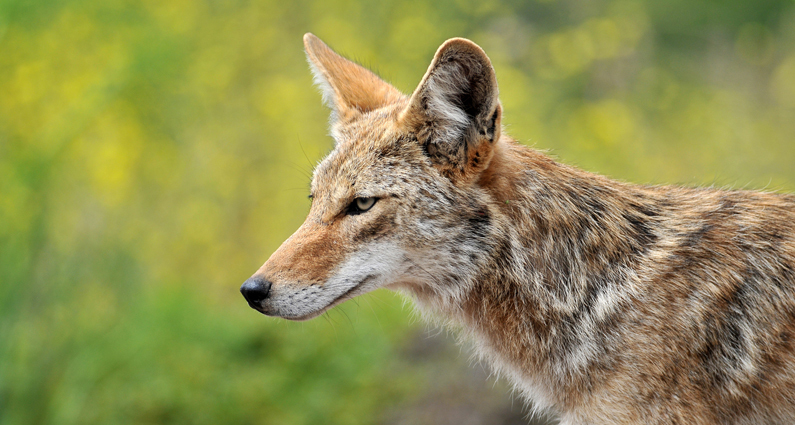 Trappers use cage traps, snares and even steel leghold traps to capture coyotes. Florida law requires that captured coyotes be killed; coyotes cannot legally be relocated to public land. Trapping and killing coyotes is at best a temporary solution. When an individual coyote is killed, others soon take their place. Please contact ARFF if your homeowners association or city is considering hiring a trapper to kill coyotes. ARFF will work to encourage humane, proactive approaches to decrease negative encounters with coyotes.